The total system includes the Luminex 200 instrument, the Luminex XY plate handling platform, and the Luminex SD sheath fluid delivery system, software and PC. A professional Training Session for one person is included. Built on xMAP® technology, this system allows multiplexing of up to 100 analytes in a single well of a microtiter plate and is compatible with kits designed for the Luminex 100 instrument. Enhancements over the Luminex 100 instrument include tool-free sample probe height adjustment, an XYP alignment guide, and a high-performance compressor. 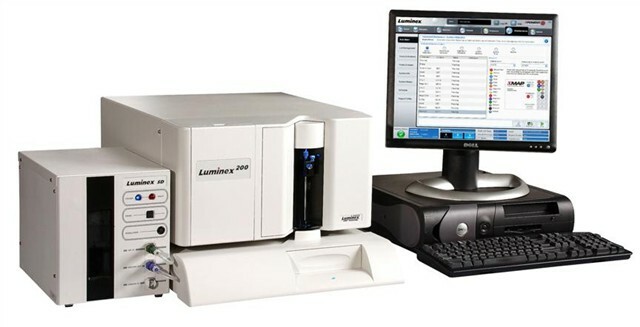 The Luminex System is a flexible analyzer based on the principles of flow cytometry that is designed to meet the needs of laboratory medicine and the care of patients, as well being used in the research environment. The system enables you to multiplex (simultaneously measure) up to 100 analytes in a single microplate well, using very small sample volumes. The system delivers fast and cost-effective bioassay results on many assay formats including nucleic acid assays, receptor-ligand assays, immunoassays and enzymatic assays. The Luminex System is the combination of three core xMAP technologies. The first is xMAP microspheres, a family of 100 fluorescently dyed 5.6 micron-sized polystyrene microspheres that act as both the identifier and the solid surface to build the assay. The second is a flow cytometry-based instrument, the Luminex analyzer, which integrates key xMAP detection components such as lasers, optics, advanced fluidics and high-speed digital signal processors. The third component is the IS 2.3 software, which is designed for template-based data acquisition with robust data regression analysis - ideal for the clinical laboratory setting. The Luminex 200 System has a device master file (DMF) on file at the FDA, and kits developed by Luminex strategic partners that have received 510(k) clearance from the FDA can be used on the Luminex 200 system for diagnostic purposes. Misclassification of microspheres: = 2%. May vary by xMAP microsphere product lines. Refer to the specific product information sheet for further details. System warm up: 30 minutes. Systems that remain inactive for at least four hours will require a warm-up to restart the lasers. After acquiring sample, running system calibrators, running system controls or warming up the instrument, the system resets the four-hour internal clock. round, filter bottom, half plates, overall height no more than 0.75” (19mm), any color. All that the Luminex 100 system is and more! New Vertical probe height adjustment - enables user ease through simplified probe adjustment – no tools required! Precision - machined alignment plate through to the XYP – enhances alignment, decreases time required to align and improves reliable placement of sample probe. Removable front bezel – enables quick access to front of instrument and minimizes exposure to inner workings of the instrument. Painted fluidics compartment and new, hard feet – minimizes potential for corrosion and improves overall system alignment, respectively. New air compressor – provides quieter operation and improved reliability. Other quality improvements – to improve reliability and ease of maintenance. needs red laser iligmrnd. i have the nessesary tools sach like osciloscope can any body help with instructions? There are no threads in Luminex 200 Total System Reviews at this time.